Embarcadero has provided a free online chat service to Embarcadero Developer Network members since November 2007. For more information on our chat server, see its introductory article. 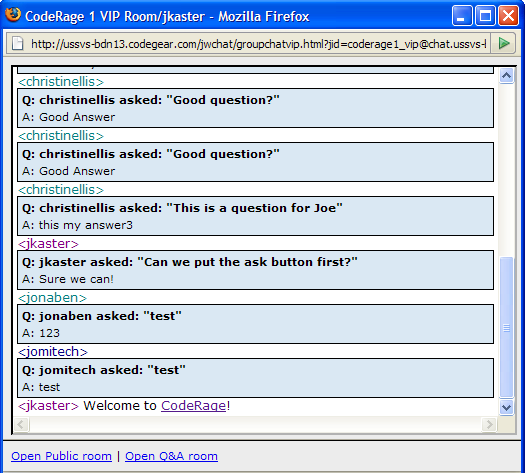 We also published a chat FAQ during CodeRage. All documentation currently available for our chat system can be seen at http://edn.embarcadero.com/help/chat. All that is required to join a chat is a Embarcadero Developer Network (EDN) account. EDN accounts are available free of charge. If you don't have an account yet, our chat system can walk you through the process of creating an account when you want to join a chat. 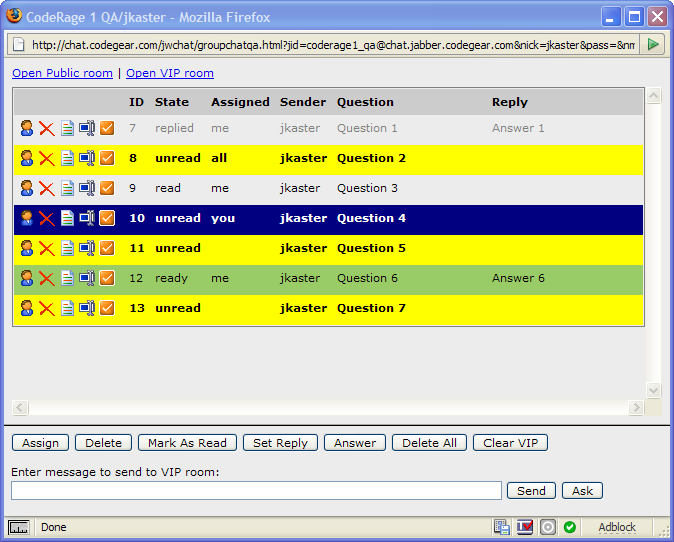 We use a customized JWChat as our browser interface. You can click on the link for a chat room and automatically join the chat. If you are not yet logged in, you will be prompted to do so during the joining process. Note: You must enable pop-ups for chat.embarcadero.com (or *.embarcadero.com) and enable cookies for embarcadero.com for our browser-based chat system to function properly on your machine. The GUI client we recommend for our chat system is Pidgin, which supports far more than just Jabber for instant messaging. It is available on a variety of platforms. 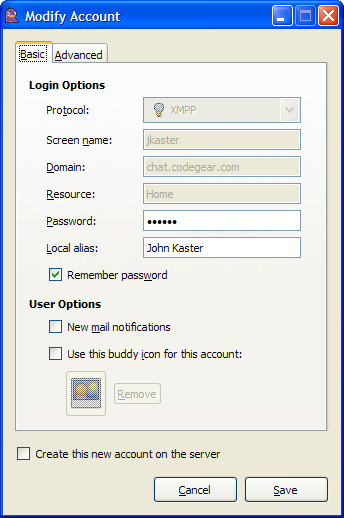 To connect to our Jabber server with Pidgin, use the following values for the dialog under the Accounts menu on the Pidgin buddy list window, but change the user information to your Embarcadero Developer Network login rather than mine! Use the Accounts|Add/Edit menu to edit or create your account. Your screen name should be your developer network Login name. You can view your login name with the login form at https://members.embarcadero.com. If the values on the form are blank, just do your login and you can see all your account values. The password you provide is the same as your Developer Network login. Then, use Tools|Room List menu to start retrieving the list of group chat rooms hosted on our server. 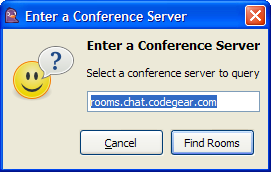 Use "rooms.chat.embarcadero.com" as the conference server name if it's not already set, and click [Find Rooms]. Select the room you wish to join, and click the [Join] button. If you want to add the room to your "roster" of chats, click the [Add Chat] button instead. We have extended JWChat and OpenFire with special features that are discussed in this section. The room list is a "dashboard" page that shows participation levels in the current chat rooms. Room status is updated every 15 seconds. The countdown can be pre-empted by clicking on the "refreshing" link. Any room on the list can be joined via the browser by clicking on the room name. The room list is available at http://chat.embarcadero.com. Any room that is currently "open" appears in the room list. Rooms that require moderation will be displayed when a moderator is available, and will disappear when a moderator is not present. We have also introduced a "Question and Answer" (Q&A) interface for web broadcasts like our online conferences and public chats. For the browser, this Q&A interface uses three (3) chat rooms that pop up on request, and can be placed anywhere on your monitor(s): the public chat room, the VIP room, and the Q&A room. Note: Pidgin and other jabber clients can be used to participate in VIP chat rooms but the output will not be formatted nicely like our browser interface shows. You can ask questions by prefacing your chat text with /ask. 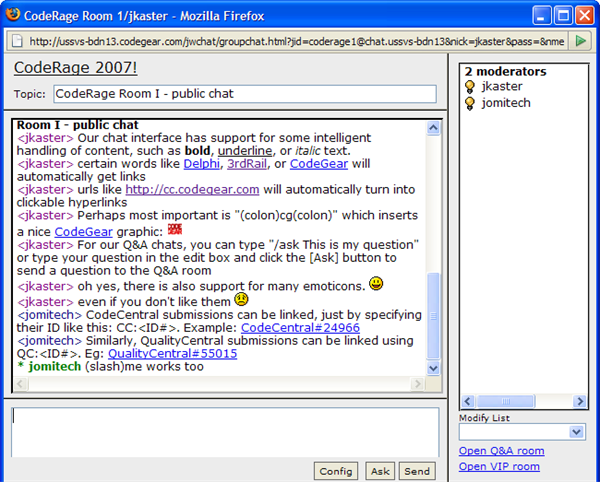 The public chat room can be used by all people attending the chat, including moderators. Chat participants can /ask questions in moderated chat rooms, and receive notification that their question has been submitted to Q&A room. The Q&A room is only visible to chat moderators. Answers to /asked questions appear in the VIP room. The main difference between the public chat room for Q&A chats and other public group chats are the [Ask] button, and links to the other rooms used during the event. Clicking on the link for another room will automatically join you to that room, or re-display it if you're "in" the room but it is not visible on your display. For all participants, the public chat room has a link to open the VIP room. Moderators will also have a link to the Q&A room. Chat administrators can toggle any user as a moderator. If a user is a moderator, a link to open the Q&A room appears in the public chat room. Only moderators can post content to the VIP room. Questions answered in the Q&A room appear in the VIP room with some special formatting to group the question and answer together. Moderators can also post messages directly to the VIP room from the Q&A room. Only moderators can see the Q&A room. The Q&A room color codes the status of the questions. As the following screen shot shows, multiple actions are available for processing questions. All buttons except for [Send] and [Ask] require a specific question to be selected in the queue. Sets the text field for the "Assigned" column if a specific user should answer the question. Changes the status of a message from unread to read (only for your own browser view). Question ID 9 has been marked as "read" in the screenshot above. Assign the text of the reply to the question. The question itself can also be edited in this dialog. Question 6 above has its reply set, so it is ready to be answered. Send the question and reply to the VIP room. The question must have a reply to be sent. Question ID 7 above has been answered. Submits a question to the Q&A queue. /ask <question> can also be used, just as it works in the public chat room. Send a message to the VIP room. This message has all the special handling described above in the public chat room section. 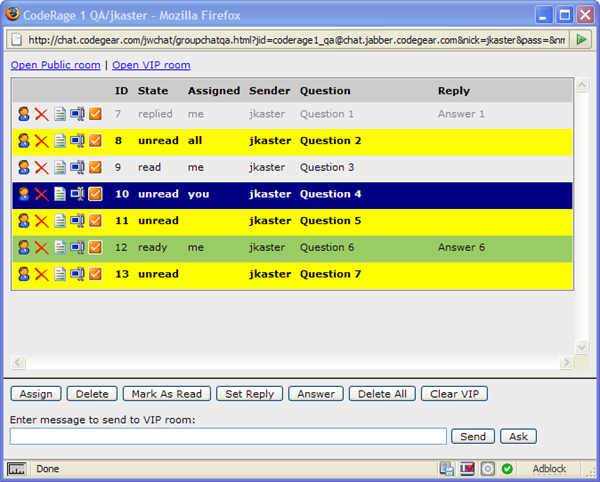 JWChat has special text recognition enhancements for chat messaging presented in the browser. It also supports a subset of IRC commands, and some different commands applicable to browser client chats. The command syntax is a slash character, followed by the command, and the text to parse for the command. Ask a question. Only available in certain Q&A chats. /ask Why is there air? 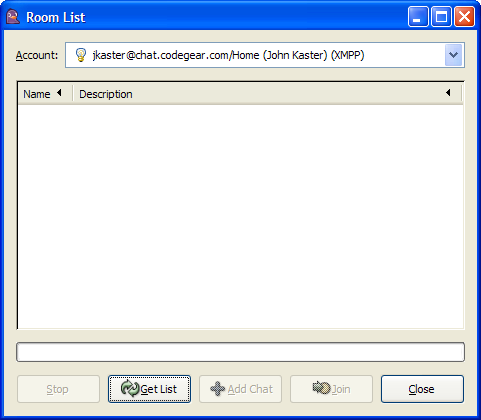 Join a chat room by room name. Moderator only. Ban a user from using our chat server. Moderator only. Kick a user out of a chat room. They can rejoin the chat again. Clears the current chat display in your browser window. Does not clear chat history for the room. Sets your chat nickname. This option is not available in Embarcadero chats. If your Embarcadero user account has a nickname set, it will be used in the chat room. If you don't have a nickname specified, FirstName_LastName is used as your nickname. You can set your nickname in membership services. Moderator only. Sets the topic of the chat room. Invites a user to join the chat. Available in most chat rooms. Send a private message to a specific user. Many text patterns are treated specially by the JWChat browser client, including recognition of url patterns, bold and underline. We have also extended the JWChat regex matching to support italics with a syntax like /this should be in italics/. Hi, I am from Ukraine. Our company buy a license of Delphi. But I forget a serial number. How I can restore of it. I have only SKU, w/O, bar code.